Paul Feig’s Ghostbusters took some time from filming to visit Tufts Hospital in Boston Saturday afternoon. Kristen Wiig, Melissa McCarthy, Kate McKinnon and Leslie Jones all made the appearance is full Ghostbusting attire while taking time to get to know the residents of The Floating Hospital for Children, a full service pediatric hospital servicing newborn infants to young adults. Note how lo-fi the packs look compared to the packs in the original films. I had a feeling that we might see the equipment evolve over the course of the film and it looks like this theory is confirmed with the pictures released by Tufts on their Facebook account. Immediately apparent is a very different thrower than the version in Feig’s original image. There are some very good looks at the updated thrower in these images. You should also note that it looks like the pack itself is different. It still appears to consist of the pack in Feig’s image, but with some additions. Unfortunately, there are no clear looks in the pictures released from the appearance but you can see that things are definitely different back there. Reportedly the kids at the Floating Hospital hung a sign in the windows that spelled out “Who ya gonna call?” that caught the attention of the cast and crew filming below. It was sweet of everyone to take time out of their busy schedule to raise the spirits of some kids going through a tough time at the Floating Hospital. It’s kind of a strange choice to have Ghostbusters spending time with kids who might be considering their own mortality, but I’m sure they handled the situation with grace and humor. 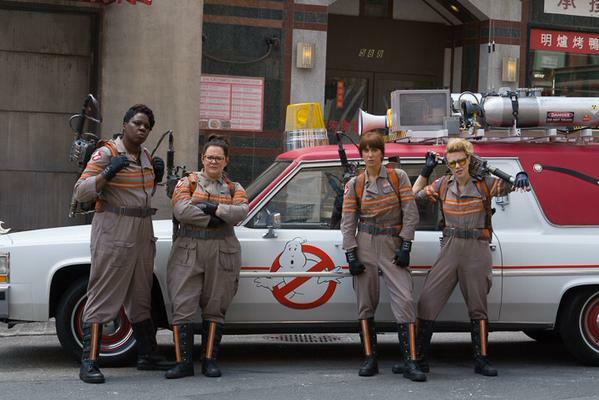 This entry was posted in Breaking News, Film and tagged Ghostbusters, Ghostbusters Reboot, kate mckinnon, kristen wiig, leslie jones, melissa mccarthy, Paul Feig. Bookmark the permalink.